So the time has come for the newest album from Dream Theater – the band I’ve invested much time in for the past 7 years as being an active moderator in their chatroom as well as being active as one of the leaders in the norwegian fan club. After going to the record company to setup a potential listening party for the release of Systematic Chaos, I recieved the promo and I have listened to it religously for the past few days. Approaching it with an open mind, with few expectations and much interest, this has proven to be one of the most exciting Dream Theater releases in years for my part – albeit with some minor flaws that stops it from being a perfect album. 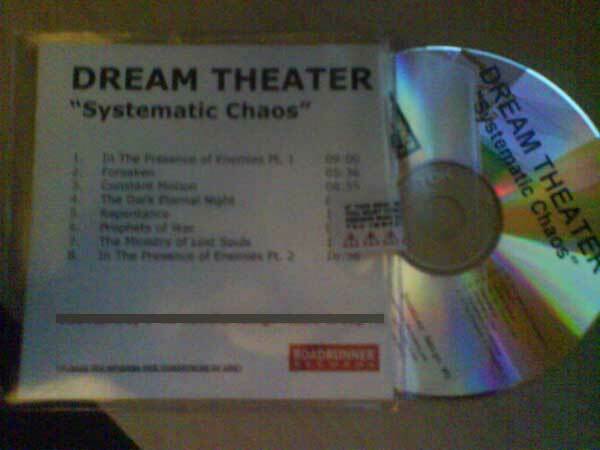 Now, looking at the album as a piece of Dream Theater’s catalogue, it’s an album that pretty much signifies a new start for Dream Theater. Whereas the previous 4 albums have been rather consistent in their sound and thematics (in the sense that they dealt with personal issues such as psychological problems, religion, ethics, politics and so on – and musically stayed within a familiar path of progressive metal although each album retained a «signature»), this album displays a freshness in how they express themselves with the words and music. But it still retains that Dream Theater feeling that is so familiar, it just does it in a new setting. It is simply an album that is fun to listen to! It has great riffs, it is heavy, and it has great vocal parts. There is a lot of vocals sung by the other Dream Theater members – either in unison with James Labrie, or sung alternatively, and that makes it a lot more interesting vocally. Overall, it sounds great, the album has a wonderful mix as well with depth between the instruments, they come through well-defined and with just that right punch and clarity. The album starts with their new epic song, In The Presence of Enemies Pt. 1. The song is probably one of the songs on the album that is most like what they’ve done before. It starts off with a bang, and keeps it up throughout with pure progressive goodness – there are pieces in here that just made me grin of delight. Excellent guitar sounds and interesting synth-usage that reminds me a bit of vintage prog. There are guitar solos that lead the melody with a flowing feel, simply beautiful. The song varies from the hard and heavy prog metal we’re used to from Dream Theater with the insane guitar solos and unisons – to the slower parts filled with emotional playing. It reminds me of Liquid Tension Experiment, particularly the more slower parts. A bit like Liquid Tension Experiment meets Octavarium. And it never seems to go overboard with the unnecessary instrumental parts. This track will certainly please the long-time Dream Theater fans. We then move on to one of the more pop-sounding tracks on the album, Forsaken. It’s a pretty straight forward metal piece, reminding me a bit of the newer alternative metal that has been very popular the past few years. Simple riffing, a bit like Linkin Park or Evanescence particularly during the verses. The chorus is, for me, pretty cheesy. It has that arena rock/pop-metal «singalong» feel to it, with cliched lyrics that left me a bit embarrased – «Forsaken, I have come for you tonight. Awaken, look in my eyes and take my hand.» The solo on this song is very good, it reminds me of the Awake solos, and is some of the best work Petrucci has done in years – too bad it’s so short. This is probably the most commercial sounding song on the entire album. And it works very well as a pop metal track. Constant Motion has, by the time this is read, been out for a while already. A pretty straight forward prog metal piece that is also their first «single» of the album and will be released as a video. With quite simple riffing, it works well as a metal song – it sounds like a mix between Megadeth riffing and Metallica vocals during the verses. The chorus is great, with sounds in the background that heavily reminds me of Lie from Awake. You can see that they wanted to create a metal song with balls – of the type that Metallica used to create. Halfway through the song, the song goes into pure Dream Theater mode – with the crazy rhythms and solos we’ve come to expect from them. Great guitar solo! And a typical Jordan Rudess keyboard solo (on both good and bad). Overall this is a damn good song that I think will be quite a hit – it has the potential of drawing new fans as well as showing the existing fans that Dream Theater still is going strong. Yes, it is a bit straight forward, but that is not a bad thing at all! The next track brings the first REALLY big surprise on us. It starts out with a heavy, simple riff that just sets the mood for an all out headbanging session. And when the vocals come in… Completely distorted vocals more shouted than sung, by a group of people. And in between, there’s some crazy doublebeat rhythms where the vocals are sung over, that at first listen just captured me completely because of its unexpectedness. But it sounds GREAT! The chorus is pretty straight forward though. After a few minutes of this, the song goes into mental overdrive, with insane riffing on the keyboard and synths, with solos left and right, which should please the prog metal fans. Kinda like a Dance of Eternity, only with vocals – it even has the given Rag Time keyboard bit in the middle. It changes styles and rhythms ever so often, yet keeping the same type of riffs throughout. This is my absolute favorite on this album, the epitome of what Dream Theater is. It is by far the most outright heavy song Dream Theater has ever done – some people have said Meshuggah-like, which might to some degree be true. Meshuggah meets Dance of Eternity? Repentance is the next part of the ongoing Alcoholics Anonymous series. The basis of the song is the riff that drives the vocal bits at the beginning of This Dying Soul – only done in a Opeth/Porcupine Tree/Pink Floyd style. The song is a long, mellow piece with very little instrumental insanity – the song is kept at the bare minimum for effect. Instead, they try to just adjust the ambience every so often to keep it interesting, and it works very well. Particularly towards the end, where the main parts of the song is clean guitars, piano and drums and a vocal group just singing chords for the entire time – but keeping the bass heavily distorted. And there is mellotron. Mellotron!! This track is just perfect, it is a great song with a lot of emotions. Now on to a song I think might cause the most controversy of the songs, at least for the fans. After the heavy criticism on Octavarium for having a huge Muse influence, this song starts out with a VERY apparent muse liftoff. There are some great riffs in here, and the song is well built. With some very interesting vocal parts. Particularly the parts where the 50 fans that were invited to the studio to lay down some tracks are really rocking – this is going to be a hit live. When i say controversy, i’m not just talking about the Muse influence though. The lyrics are, as the title suggest, a comment on wars – and will be viewed as a comment on the current situation for the US. «It burns deep down inside of me, we have ourselves to blame, not questioning – accepted as the truth. » «Is it time to make a change». A pretty serious matter of discussion – and yet the music kinda sounds happy to me, which confuses me. The ministry of lost souls is yet another beast. This is one of the slow building songs, that begins as a «ballad» style song, and keeps that going for a while to build on itself before taking off entirely towards the end. It is this albums «Sacrified Sons» – the similarities are pretty uncanny. It is built up in much the same way, and has the same amounts of shredding. A good track, but not particularly memorable for me. It doesn’t even get really interesting until the 7 minute mark – before that it is pretty generic and forgettable. The album ends with the completion of the epic song, In the Presence of Enemies. Continuing some thematics from the first part, this continues the story from the song, but takes on a much darked mood than hte first part. But at 4 minutes, this song becomes a different beast altogether – was I listening to Dream Theater or some generic Power Metal band. The lyrics are cheesy, talking about Dark Masters and whatnot. With some background vocals pitched down to «demon level» (If you’ve seen Stargate SG-1, think Ghoauld voices). But it only lasts for a couple of minutes before the song goes into complete Dream Theater overdrive again, with crazy instrumental parts as we’re used to (reminding me of Scenes from a memory) . Overall, the song is pretty good, but also pretty standard Dream Theater. Altogether, the album is pretty great. I like it a lot, even though there are some parts that I’m not terribly interested in. There is a lot of other interesting stuff here though, and a lot of surprises for the fans. Some parts are pretty commercial, with a simple «pop metal» sound, some is clicheed and rehashed Dream Theater material, but the overall feeling is that this is the new beginning for Dream Theater that they needed after moving from their old record company to their new. For me, this album has already worked its way up between my favorite albums of this years, and ranks pretty high for the Dream Theater albums. It’s not the straight prog metal album people expected, it’s not even a typical Dream Theater album. But if you manage to listen to it without a preconsieved notion of what a Dream Theater album should be, I think you might find that it is a very strong album on its own. It has all the elements we’ve come to love from Dream Theater, but it also has so many new elements (for Dream Theater) that it makes this album one of the most exciting releases they’ve done so far.